I just want to put this out there – I intensely dislike shopping, and shoe shopping takes me to a special level of hell. I am always appalled at the cost of a simple pair of shoes. My orthotic inserts and fussy feet also mean that my shoe choices are limited and a wrong decision in footwear can end up costing me both money and time. So when my $29 Walmart-purchased, all-purpose rubber boots developed a distressingly large hole in the area of the front right toe last week, I was horrified. The temperatures, though largely below the freezing point, were offering up some warmer days and puddles were everywhere. I went through a few miserable days with sodden, chilly feet. In the words of my hero Red Green, “[t]he handyman’s secret weapon – duct tape” should be the answer to all of these little life quandaries (IMDb, 2014). So I popped out to my local RONA and purchased a hefty roll of duct tape for $8, congratulating myself all the way. I would have spent easily $40 on a decent pair of rubber boots – this was the perfect idea! I wrapped both boots in duct tape and stood back to admire my work. Unfortunately, my hero Red Green also noted in this video that duct tape looks like an “astronaut’s garbage bag”. Consequently, that’s what my boots resembled when I was done (see below). 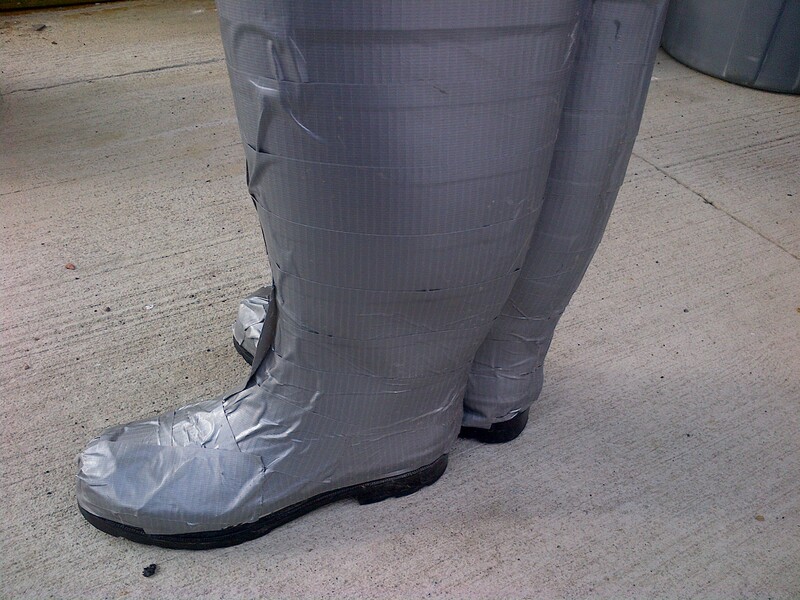 The finished product – my $8 rubber boot re-invigoration project. Now I realize that in this difficult economy we are some of us wearing the word “cheapskate” as a badge of honour (McKay, December 2011). I tried, for the first few days, to enjoy the wearing of my cheaply re-furbished boots. I had one lady compliment me on them – sort of (“Oh! I thought that the boots had a special design on them!”), and one gentleman tell me that I needed new boots, pronto. For my part, I felt that my feet were warmer and drier than they had been pre-duct tape. With several days of use, however, I started to notice that the duct tape was peeling away from the rubber beneath. Thinking that perhaps I had not properly applied the duct tape in the first place, I diligently peeled away a few layers of tape and reapplied. The same thing happened again shortly afterwards. I suddenly saw myself investing a significant amount of time and money into the bandage solution of duct tape. And although I was loathe to admit to any vanity, I also felt embarrassed to be walking around with astronaut’s garbage bags attached to my feet. Feeling slightly cured of my penny-pinching ways, I went out and purchased a lovely pair of sturdy, steel-toed hiking boots that will see me through any weather (they are the Dakota brand women’s low-cut hikers, a brand I’ve had tremendous success with in the past). And thus ends my tale of how a combination of duct tape and shoddy rubber boots from Walmart led me to seek out a cure with a pair of decent, weather-ready hiking boots. Don’t try this at home, folks! I love how you quote your sources for everything, even on a topic like making duct tape boots. I know of many people who could learn a lot from you who spin personal opinion as facts. Keep up the good work! I’ll definitely continue to provide background references for all quotes used in my posts. I agree that it’s a good habit to keep up!